This book should have a wide appeal, especially to those who may place themselves at the progressive end of the educational spectrum, because you discover that Martin Robinson wants what we all want for our children. That is, schools where children can flourish without having their innate curiosity, creativity and love of life and learning crushed by the deadening effects of exams-driven curricula, policies and procedures. This isn’t just a man in an ivory tower philosophizing from a detached stand point. This book is partly borne out of the frustrations of a father who wants the best for his daughter and so his cause is one which should have a wide appeal. The book summarizes the history of formal western education from its origins in classical antiquity. This is a helpful thing to understand if we want to be able to evaluate why we do what we do. We can’t just take for granted that ours is the best way to educate unless we know what the alternatives are or, in this case, the roots from which our current model has evolved. The progressive, child centered model that exists in mainstream UK schools today is a relatively new one when compared with 2000 years of educational ideas and methods. The divergence has been a slow process. Much of it has taken place over the last century or so, but the roots of it began in the enlightenment. 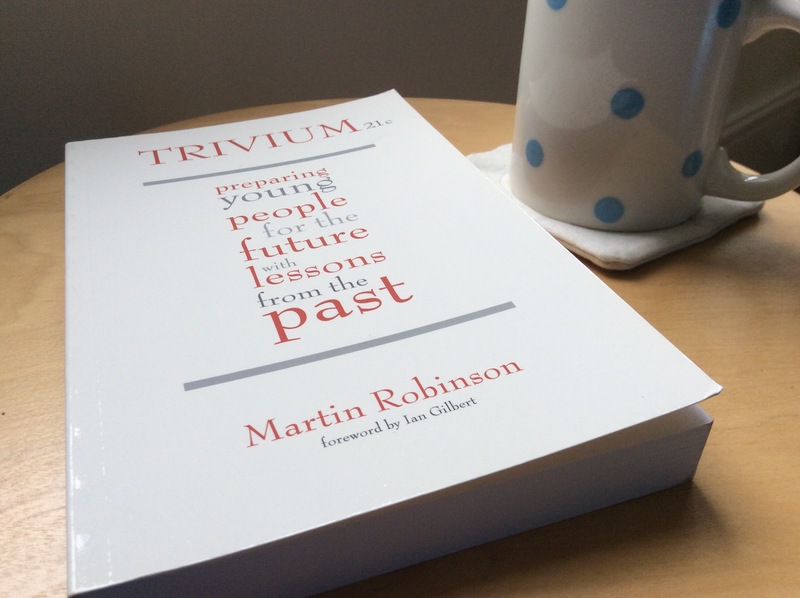 Trivium 21st Century helps us understand where we are today and why. Robinson introduces us to the idea of the trivium or the “three ways”: three roads to knowledge, wisdom and virtue which are summarized in the words grammar ( not to be confused with our modern day use of the word, but rather representing our cultural heritage or shared knowledge), dialectic (the use of logic and argument and the pursuit of an ideal) and rhetoric (the meeting place where we learn to express ourselves articulately and persuasively in engagement with others). I say this is an interesting introduction, as I am not certain whether everyone involved in classical education today would agree exactly with the detail of Robinson’s own summary of these three and their application in the 21st Century. (For example, Karen Glass’ summary of classical education in “Consider This” would place the emphasis on synthesis as opposed to analysis, which I mention below.) However, there is much that they would agree on and I commend him for having the courage to take a step back and consider the possibility that we may have something to learn from the past, which is not an idea we hear very often in our individualized western culture today. I also commend and agree with the idea that the trivium embodies an approach to education which needs to be recovered (however we apply it in practice), because it is based on a wholistic view of a person as mind, body, heart and soul. Like Robinson, I think there is a deep human desire in all of us for meaning and significance, something which rises above mere utility and, because the classical model of the trivium was based on this understanding of human personhood, I think it has much to offer and therefore needs our careful consideration. In order to know how to educate a person, we must first of all understand what it means to be a person. The classical ideal sought to do this. A point to agree on? Robinson also explores the idea that the trivium can appeal to both ends of the educational spectrum – grammar for the traditionalists, dialectic for the progressives and rhetoric as the meeting place for these two extremes. Whilst this feels a little bit too stereotyped, I can see the point he is making and I think it is a valid one. Our educational debate has become too polarized and exploring some of Robinson’s ideas could help us find some common ground. Towards the end of the book he seeks to do that very thing by interviewing people from both sides of the political and educational debate and shows how we have more in common than we might think. We need to address the problem of communication that is too often focused around social media which, by its very nature, does not allow for nuance. In order to make progress we need to take the time to read and think more deeply. I suppose it is fitting that the Trivium, if applied well, can provide us with the tools to do so. The book also asks a very important question: is a secular approach to the trivium possible? I love the fact that he is asking this question! It represents a shift which I have seen in other books in recent years which seem to be addressing ideas rather than just methods. This is crucial because ideas shape our methods and if our ideas are wrong then our methods cannot help us. I’m not sure that he clearly articulates within the book how he resolves this tension for himself. I agree with him holding out the the trivium as a helpful model which can be applied in any century because it is shaped, not by the needs of the time, but the needs of the person. I, however, am not a relativist. I would like to ask him what are the moral sources he has for the moral intuitions he feels. Robinson shows how the trivium’s goal is (and always has been) that of wisdom, virtue (good character) and human flourishing, which stands in stark contrast to the utilitarian model we have today with its emphasis on passing tests. He argues this by saying that when faced with a choice between a knowledgeable man and a good one we will always choose the good. This is another point that should appeal widely to all those dissatisfied with our exams-driven system but is also commendable because, again, it reflects what we instinctively know to be true about human personhood. Knowledge and skills have their place in education but only as servants to the greater goal – that of character development. The aims-based “authentic curriculum” that Robinson argues for could definitely help us break the cycle of constant change with new initiatives. If you want to see children leaving school as knowledgeable, skilled and well rounded citizens who love learning, Robinson’s book is definitely worth a read. Previous Post Why “Education that Feeds the Whole Person”?